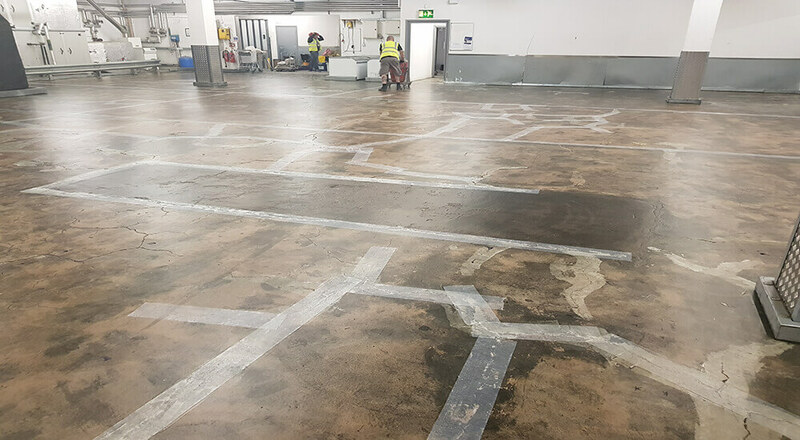 Flowstone Industrial Flooring Limited were pleased to be reappointed as the resin flooring contractor for Aldi, to carry out floor refurbishment works to their Arndale store. The Cient required some concrete repairs and a new, durable and decorative floor finish to their warehouse and stock room chiller area. The floor measured approximately 406 sqm. The main objective was to lay a new floor with no disruption to the store during trading hours. Due to the limited time the store could close for, we specified Virtus Resins Flowdur PAS, a fast-curing polyaspartic decorative flake system. We understand that in retail time is money. A fast turnaround on the project was essential. The warehouse could only be handed over to us during the store closing times and for a maximum of 10 hours at a time. Furthermore, the floor needed to be operational during the day. Flowstone rose to the challenge by carrying out the works on night shifts. 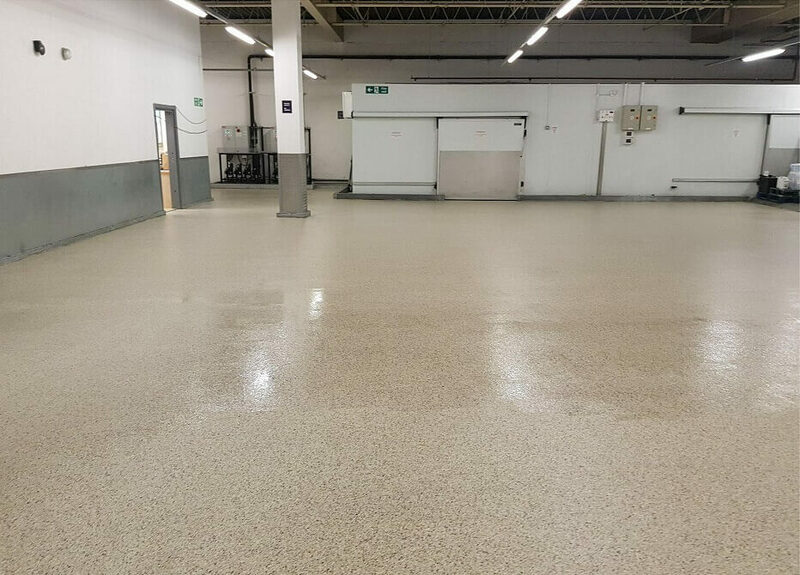 Additionally, we chose a very fast drying resin system which as well as being a durable resin floor coating, it allowed for the floor to be fully trafficked and operational first thing in the morning. Our team set to work by carrying out diamond grinding to mechanically remove the old floor surface and leave a clean keyed surface ready for the application of a new floor finish. A number of remedial concrete repairs were carried out to the lower store warehouse floor and to the backup chiller in the upper warehouse. The entire floor area was banded in order to reinforce the concrete floor base in preparation of the resin coatings. The Flowdur PAS polyaspartic system was laid as a two coat coloured system, spread to the desired thickness with a rubber squeegee and finished immediately with a roller. Decorative PVA flakes were scattered onto the resin and allowed to dry. Excess flakes were then removed by sweeping followed by vacuuming until the surface was free from all loose particles. The floor was then sealed with Flowdur PAS Clear. It is also possible to add glitter for a more glitzy appearance or coloured quartz aggregate instead of flakes to create a textured finish. The Client was very pleased with the final result and with Flowstone’s flexibility in accommodating their requirement for out-of-hours works, as well as ability to change resin system specification with minimal disruption to the scope of works. So much so, that they have continued to appoint Flowstone to carry out further refurbishment works to other Aldi stores and warehouses. If you have a similar project, get in touch.